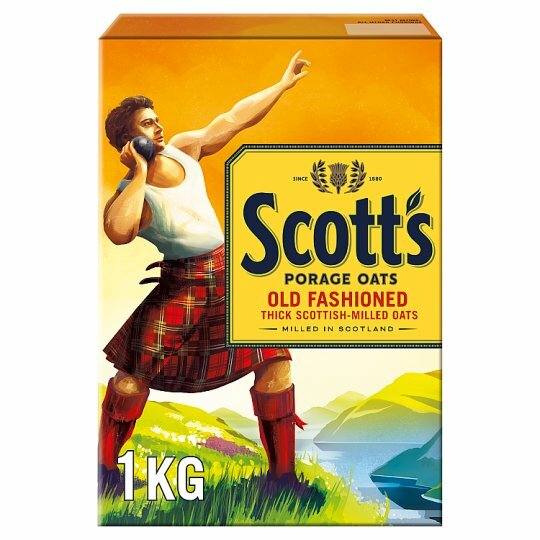 Scott's Porage Oats have been milled in Scotland since 1880 and to ensure you enjoy every bowlful we use only the highest quality oats and milling processes. We carefully grade and select each grain so that only the best oats go into every pack. To create our own distinctive taste the oats are rolled thicker and are gently kilned - to bring you the true taste of Scotland! Oat beta-glucan 3.6g per 100g. Each serving (40g) contains 47% of the 3g of oat beta-glucan suggested per day. Simply mix 40g of Oats with 195ml of milk (or cold water) in a saucepan and bring to the boil. Simmer for 6 minutes, stirring occasionally. Serve with sugar or salt to taste. Enjoy! Simply mix 40g of Oats with 195ml of milk (or cold water). Stir. Microwave oats uncovered on High (minimum 800w, category E) for 2 1/2 minutes. Remove with care - bowl can be hot. For a slightly sweeter taste, stir in a tablespoon of golden syrup to your warm bowl of Scott's Porage Oats. Please be careful with hot product. If possible, please state when and where the product was purchased. We shall be pleased to reimburse you for the product. Your statutory rights are not affected.